10-Year Anniversary: The Shondes’ The Red Sea | Oy Oy Oy Gevalt! 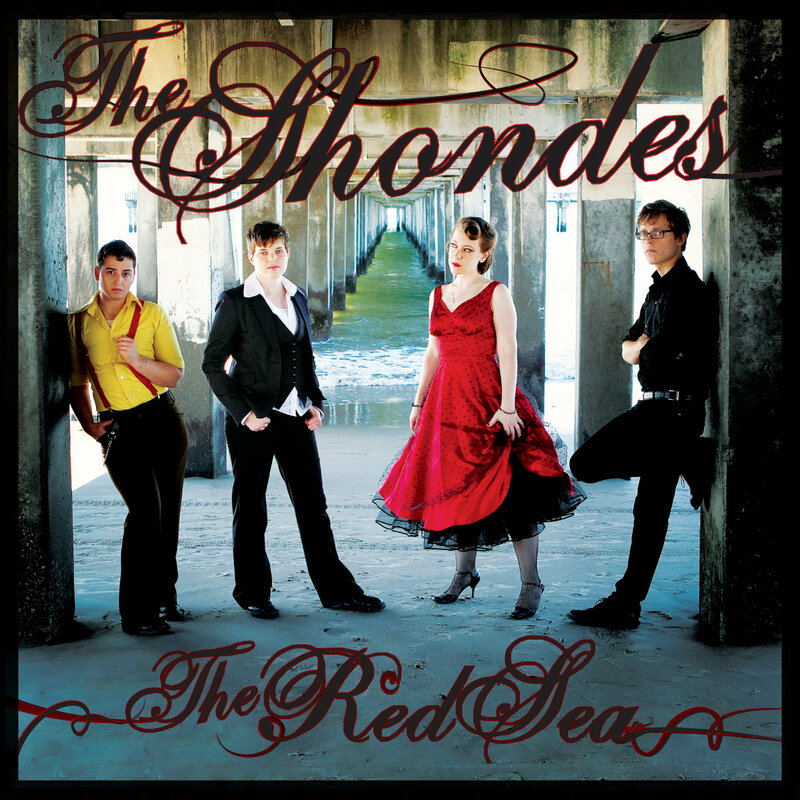 Ten years ago today, the Shondes released their debut album, The Red Sea. Until their latest release, 2016’s Brighton, it was the Shondes album with the most overtly Jewish content. The rockin’ “Let’s Go” features a “Let’s go!” chant in both English and Yiddish (“Lomir gayn!“). Band members came up with the idea for “I Watched the Temple Fall” while singing from the Book of Lamentations (Eichah), talking about the teachings of Rabbi Abraham Joshua Heschel, and looking to speak out about the Israeli-Palestinian conflict, all while walking home from Tisha B’Av services. “At the Water” draws inspiration for social justice advocacy from the story of Nashon from Exodus. These are hard-hitting, intelligent songs written by thoughtful Jewish musicians. That being said, the Shondes have changed their approach since their first album. In a November 2013 interview for Oy Oy Oy Gevalt! Jews and Punk, singer/bassist Louisa Solomon and violinist Elijah Oberman reflected on how their use of Jewish content has evolved. With five albums, the Shondes are still going strong. They’re playing in Brooklyn this Friday. LS: Our use of Jewish culture and Yiddishkayt in our music has really changed. It’s interesting that you noted that there’s a lot less of it on Searchlights [the Shondes’ third album, 2011] and then there’s a lot of it in a really different way on The Garden [the fourth album, 2013]. And what I think is neat is that, as we’ve gotten more confident with our musicianship and our punky-pop-rock craft, the context for the Judaism has gotten simpler. It’s not so high-fallutin’. I never meant to be overly complicated in the days of The Red Sea. EO: We were just genuinely excited about it at the time. EO: It’s much easier to say, “There’s nothing more whole than a broken heart” is based on a Yiddish saying that goes “There’s nothing more whole than a broken heart,” than it is to be, like, Well, we took the melody from Eichah, and then we were thinking about Heschel, and then we were walking home singing blah blah blah. It’s more straightforward, and I think that the confidence and the songwriting craft getting higher is about simplicity and just being, like, We’re just going to say this thing, because that’s the thing, instead of trying to stuff ten things into one [song]. LS: I think as you grow up, ideally, you get less fearful of laying yourself bare. I know we have. And that means if you’re trying to express something simple, the best song is going to be the song that just says that thing. If it’s complex, talk about complexity. But don’t needlessly pile fourteen things into one song. So “Let’s Go,” lomir gayn, I think that’s a great idea for a song. And if I had it now, the song would just say, “Lomir gayn! Let’s go!” And then there’d be a little verse. But there wouldn’t be 100,000 contrapuntal [parts]—every instrument in that song plays against each other. And there are two vocal lines against each other. And I love what we were trying to do because we were trying to make counterpoint speak to dialogue and be very Talmudic. And I stand behind the experiment. But I think we’ve grown up that now it’s, like, you know what, if you want to laugh and say this song isn’t saying enough and it’s too simple, too bad, because that’s punk rock! I’m just saying the thing I’m saying. I’m not a f*ckin’ poet! We’ve gotten simpler, in a way. As a relative newcomer to their music, I started listening to The Shondes with their latest album, Brighton, and worked backwards to The Red Sea, which seems light years away from they are now as a band. There are things I love about the Red Sea–when the Obermann’s violin comes in about 45 seconds into the first song “Don’t Look Down” with a riff in some kind of Phyrgian dominant scale that sounds so Jewish and makes THAT stand, as if to say our music comes out of everything we are, Jews, punks, Brooklynites, etc. I love this band.